Pre-fabricated potting benches are nice with their perfectly symmetrical dimensions and glossy finish, but few projects are as forgiving as making a potting bench yourself. After all, these benches are made to get dirty and will inevitably become weathered and worn. Look around your garage or at a local flea market and let your imagination wander in dreaming up a design based on used materials. 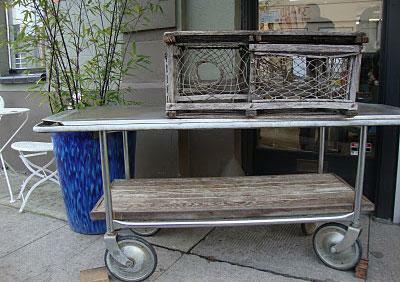 If you dismantle three or four pallets, you'll find you have enough wood for a simple potting bench. Pallets have wood roughly the size of 2x4s in the middle and on each end that give them strength. On top are thinner pieces approximating 1x4s, which form the surface that supports whatever is on the pallet. Remove the nails holding the pallets together, which is easiest to do using a hammer and small pry bar called a cat's paw - a tool designed to extract small nails embedded in wood. Pallet wood is typically very rough, so you'll want to sand it down to a smooth finish to avoid splinters later on. Use the larger pieces of wood to form a table frame and the smaller pieces to create the working surfaces, cutting them to size based on the design you desire. After your bench is assembled, use an exterior wood sealant to protect the wood from the elements and give it a nice smooth finish. Create a larger bench like the one above using several pallets so that it also includes a back with shelving. This design makes nice use of the cutouts in the larger pieces that were intended to let a forklift slide under the original pallet - now they form a decorative accent on the front of the potting bench. Store tools on the shelves on the backside of the bench. Shelving can be arranged in an unusual shape as shown, or you can make them straight across. Place big pots or baskets of tools on the large shelf below the workspace. 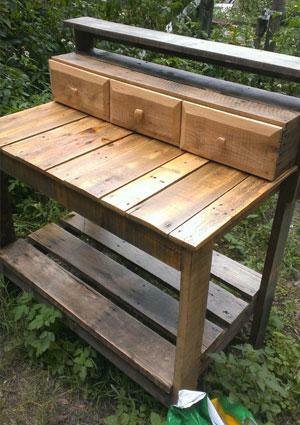 This is another example of a potting bench made primarily from pallet wood that has been creatively reconfigured. However, it has the clever addition of a set of drawers re-purposed from a piece of furniture, perfect for storing small tools. The large bottom shelf also makes it easy to keep bigger tools and pots. This design is nice enough to work indoors, as well as out, and could be outfitted with casters on the bottom to make it a mobile unit. One small touch that makes this design stand out is the use of somewhat light-colored pine wood for the surface with darker oak for the other components. Pallets can be made from either, so keep a look out for both when you're scavenging for materials. 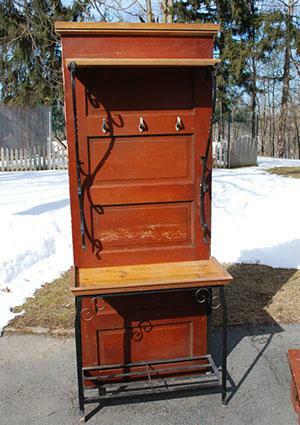 The sewing machine was removed from this antique sewing table and a sink was found to fit into the hole that was left. Old sinks like this aren't hard to find and they make sense for a potting bench because you can place potted plants in the basin to water them without getting the wooden part of the bench wet and you can clean everything up with water when you're done. 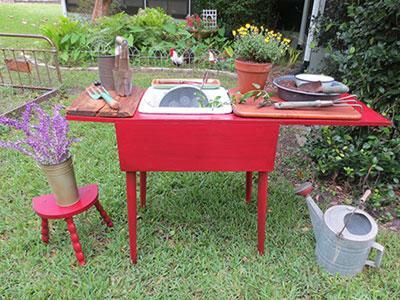 If you don't have the perfect size antique sewing table lying around, you could certainly modify any other wooden potting table design with a cutout to match the size of whatever sink you're able to find. You could use a sink with a spigot on it and pipe water to it for convenience - this set-up is great for washing vegetables harvested from the garden, as well. You will want to install a drain pipe underneath to divert the water away from your feet and over to the nearest bed. The downside of this bench is the lack of storage space, although if you want a sink feature, it more than makes up for it. There's plenty of room to work, but not a lot of storage for your tools. Add a shelf to the bottom of the table if you want a storage area. 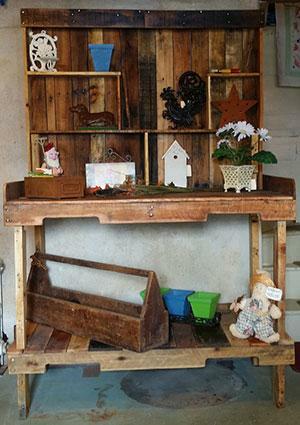 This design is a simple of example of how to transform an old door into a new potting bench. The metal base that you see was from an antique aquarium stand, but you could build it out of any number of things, whether wood or metal. One of the key aspects of this design is the trim at the top of the door. It would look incomplete without this architectural 'cap', and it would also begin weathering prematurely along its top edge without something to cover the exposed wood. Crown molding is used here, but almost any type of small dimensional lumber could be re-purposed as trim in a similar way. Tools can be stored on top of the higher wooden shelf and on the wire shelf below the work space. Hooks that were all ready on the door can be used to hang hand tools. Another option would be to use the door as the table itself, which would only work if the potting bench was going to be used indoors or undercover - otherwise rainwater would collect on the door panels and cause them to rot. This slightly macabre design idea is extremely utilitarian and ready to go. No measuring, sawing or assembly required - just roll it into the yard and park it where you want to use it. The bottom shelf is a great place for storing pots, bags of potting soil or baskets for tools, which the solid metal table will protect from the rain. In fact, the gurney's stainless steel construction means that it will last a long time out in the elements without needing any sort of sealant. If the DIY approach doesn't appeal to you and you're in the market for a really nice manufactured potting bench, the Bali Hai bench has all the bells and whistles and is made from sustainably grown shorea wood, to boot. It is intended to be used inside or out and has the appeal of a well-crafted, stylish piece of furniture. The stainless steel potting surface is easy to clean and the wood is coated with a teak-colored sealant for protection from the sun and rain. It is outfitted with drawers that will keep your seeds and hand tools dry, hooks for hanging twine and scissors and even has a towel rack for extra convenience when you're cleaning up. 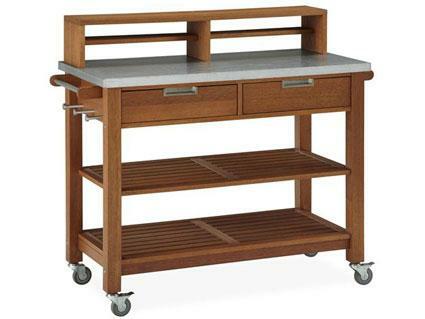 Lockable casters make it easy to move when needed and park securely. Rakuten lists it for just under $500. Potting benches are like a home for your inner gardener. The more personal style and character you give them, the more they will call to you and take you away from the stresses of life and into the magical world of plants.